You are here: Home / Dental Implants / Why Should You Get Dental Implants ? There are far-reaching consequences to losing a couple of pearly whites which extend beyond the cosmetic appeal of your smile. Not only are you no longer capable of smiling ear to ear with a missing tooth or two, but the simple tasks of eating and speaking can become extremely difficult, with a possibility of embarrassment arising because of the tenuous way that dentures and dental bridges are attached to your gums. When it comes to the replacing missing teeth, the gold standard has now been identified to be dental implants. Dental implants make use of titanium rods which are then drilled all the way into the empty dental socket. These tiny titanium rods are capable of fusing with the surrounding bone tissues, hence bolstering the strength of the entire system. 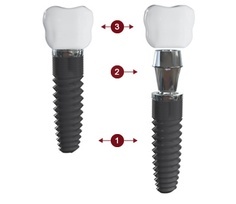 Once the dental implant has completed the osseointegration process, a porcelain crown is then placed over the implant to complete the procedure and give an appearance of a complete set of teeth. Can you get dental implants? The problem with gum infections is that your gum tissues as well as bone tissues might go through an inflammatory process, leading these tissues to become, essentially, become destroyed and unviable. This is a big problem given that the dental implant would have to be embedded deep within your gum tissues, and if there is insufficient gingival tissues, then this won’t be done properly. Your dentist might have to advise you get a gum or bone graft before you go forward with the dental implant procedure. Your immune system enables you to fight off any possible infection as well as allow you to repair any wounds, including the ones which you incur when you go through with the dental implant procedure. However, when you have a susceptible immune system, then you expose yourself to infections as well as impair your ability to resolve your wounds in an expedited manner.